For Remia Castor, a Filipina farmer living along the Jalaur, the river is not just a source of water. It is where she and her family have built their lives and culture for generations. Today, the river is in crisis, she says, because of a dam construction project funded by the Korean government as part of its official development assistance in the Philippines. 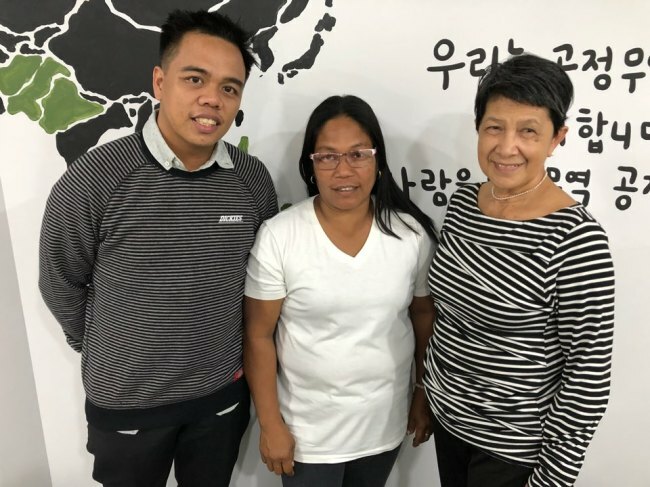 Remia was in Seoul for a four-day trip with two activists from the Philippines. They had meetings with a lawmaker as well as officials from the Export-Import Bank of Korea and Daewoo Engineering & Construction to raise awareness of the negative impact of the dam on her village. The South Korean government signed a contract with the Philippine government to provide $210 million in concessional loans for the Jalaur River Multi-purpose Project Stage II in 2012. It is funded by the Export-Import Bank of Korea, which runs the Economic Development Cooperation Fund aimed at helping developing countries expand infrastructure. The JRMP II is the second of a two-stage project aimed at tapping the current of the Jalaur River, one of the major rivers of Panay. It involves the construction of three multipurpose dams and related irrigation facilities. The Philippine government and Korea Eximbank promote the project as improving irrigation water systems, supplying more water for domestic and industrial use, and generating more electricity. But indigenous people and their advocacy groups have opposed the project, raising concerns about the environmental and cultural damage it would cause and the displacement of indigenous people from their ancestral lands. Some 17,000 indigenous people would be directly affected by the project, according to the most recent data from the Philippine government. Korea Eximbank said that eight villages and more than 2,400 households would be directly affected by the project. Cynthia Deduro, executive director at Dagsaw Panay and Guimaras Indigenous People’s Network, argues part of the process was manipulated by the Philippine government. The National Irrigation Administration intentionally skipped the process of obtaining consent from the affected indigenous people -- a process called “Free Prior Informed Consent” stipulated in the local Indigenous People Rights Act -- and thus violated their rights, she said. “The Philippine government did not consult indigenous people before it pushed ahead with the project. It conducted a survey to get needed approval from indigenous people only after it already summited a project proposal to Korea Eximbank,” she said. The residents and activists are also worried that the construction of mega dams could increase the residents’ exposure to earthquakes and subsequent landslides, as the Jalaur river dam construction is situated on the line of the active West Panay fault. Eleven earthquakes were detected in Iloilo province, where the project is planned, from January last year to March this year, according to the Philippine Institute of Volcanology and Seismology. However, the Philippine government said that the West Panay fault was inactive in the feasibility study report submitted to Korea Eximbank in 2011. An official from Korea Eximbank said that external experts conducted studies to check the societal and environmental impact of the dam project on locals’ lives and said that no safety issue had been raised. Korea Eximbank mapped out a safeguard policy in 2016 to prevent ODA projects from causing environmental and social damages to local communities. The Jalaur river project has not been able to proceed until this year due to the strong resistance from the residents. But the Philippine government said that the construction would begin in the first half of this year and Daewoo E&C won an order for the project. “The ODA project seems to be beneficial to local people, but behind the surface, it is not. It is not beneficial to Filipinos and South Korean tax payers’ money is wasted for the project,” John Ian Alaenciaga, coordinator at Jalaur River for the People’s Movement.